Relevant Knowledge came to my attention for the first time when Transcontinental mentioned that the latest version of the popular software updater SUMO contained the software as an optional component. I soon discovered that all applications by the software developer, and several other popular programs for Windows, like MediaCoder, included Relevant Knowledge. The developers earn revenue when Relevant Knowledge gets installed on a user's device. Relevant Knowledge is classified as a PUP, potentially unwanted program, or adware, by many antivirus and security applications. Lets discuss how Relevant Knowledge gets on the computer system before looking at what its functions are. The most common distribution method is through the inclusion in software installers. Software developers may integrate Relevant Knowledge in their applications as a way to earn revenue from those installations. 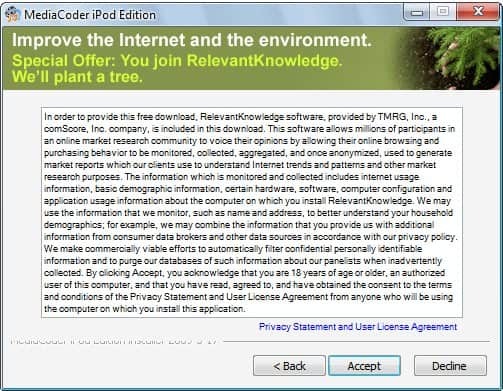 The installer of the software program displays Relevant Knowledge as a step during the installation of the actual program the user wants to install. The installers that included Relevant Knowledge did not make it very clear on first glance what Relevant Knowledge is and what benefit its installation would provide. This software allows millions of participants in an online market research community to voice their opinions by allowing their browsing and purchasing behavior to be monitored, collected, aggregated, and once anonymized, used to generate market reports which our clients use to understand Internet trends and patterns and other market research purposes. The user has the option to go back, accept or decline the agreement. Back simply goes back one screen, accept will install Relevant Knowledge on the computer system while decline will not install Relevant Knowledge and exit the software installation or skip it and proceed with the installation. Looking at the agreement it is obvious that Relevant Knowledge is collecting and monitoring information about the user, the computer system and usage. It is also clear that the collected information is combined with information from various other sources to create an extensive profile. Relevant Knowledge may also display surveys from time to time on the computer system. It is therefor clear that most anti-spyware applications and other programs that protect a computer system against malicious software consider Relevant Knowledge to be spyware. Relevant Knowledge can be uninstalled from the Windows Control Panel or Apps section of the Settings application. It has its own entry there. Uninstallation will not affect the software program it was installed with. Open the Apps section of the Settings application. Use search to find Relevant Knowledge. Click on the item, and select Uninstall. It is recommended to remove Relevant Knowledge as you may not want to give a third-party permissions to monitor, collect and analyze your browsing history and your purchases. Note: If the uninstaller fails, use Revo Uninstaller or Geek Uninstaller to remove the program forcefully. Some developers, like those who develop SUMO, provide access to a lite version of their application which will install the program without the Relevant Knowledge addition. Users who usually click-through installations should begin to pay better attentions to the dialogs presented to them to avoid installing programs like Relevant Knowledge on their computer system. The article provides information about Relevant Knowledge, a software program that monitors Internet browsing and purchases. Indeed the only trick in this ‘About Relevant Knowledge’ scheme is that of a possible confusion with the traditional EULA agreements, and it is removable, hence there is worse. What had gotten on my nerves is … the nerve of daring such an offer, and also – but I’m no Zorro – the idea some users could just get confused or misunderstand. True, SUMo is downloadable on the developers FTP pages, at ftp://ftp2.kcsoftwares.com/kcsoftwa/files/, under sumo_FF.exe, same version without the extra crap. Thanks for pointing this out and getting things clear. customer assurance ever. What a total crock of BS. is not worth installing and is best avoided. Just tried installing kcleaner from KCsoftware and found the same spyware optionally waiting to be installed. I understand the need for a revenue stream but this is rubbish. KC software offer otherwise pretty good software and it’s a bit of a shame. People no longer reccomend such products when this happens and they will find themselves with less and less downloads. ftp://ftp2.kcsoftwares.com/kcsoftwa/files/sumo_FF.exe does *not* have About Relevant Knowledge included. Don’t throw the baby with the water. And who are you trying to defend this program? I wouldn’t go around telling people it doesn’t include this garbage spyware just so that you can get more revenue. RelevantKnowledge Just installed ITSELF on me with a Justin.TV Firefox addon which installed without my permission; and I’m pissed. I managed to remove everything except for rlls.dll. According to this post http://www.askmehelpdesk.com/internet-web/removed-rlls-dll-now-internet-network-inaccessable-37711.html you can move the rlls.dll out of the system folder, then into the recycle bin to delete it. You might need to run http://www.cexx.org/lspfix.htm (download it before moving the file) to fix Winsock and be able to connect to the Internet again. Let me know if that works. Well, I’m actually quite surprised. I uninstalled it via the Control Panel, and it left everything except that DLL. Upon a hard reboot I went to find it again, the file folder, and the DLL were both gone deleted. I’m pleasantly surprised on that, but I will stay on alert about it; considering I’m sure it didn’t fully delete it 100%. I would run a scan with the free versions of superantispyware and malwarebytes just to be on the safe side. If you get the free dvd player by VLC you will get this crap. This looks like a trojan spyware in masquerade. which didnt work in any case. but be wary in any case. i had to block it from touching firefox and utorrent instanly after i opend the file. ahhh, what a headache. I did a system restore back to the day before I installed it. I didn’t see that ugly globe on my taskbar anymore so I figure that did the trick. Or is that just a tempory fix? Please tell me that’s all I needed to do. I also became infected with this nasty little program. It automatically installed itself with a firefox update, and i thought nothing of it after i disabled it in the add-ons bar. other than the fact that i couldn’t uninstall it from the add-ons bar, i figured there was nothing out of the ordinary and that i was perfectly fine… a few weeks later (tonight as a matter of fact) however, i found that upon opening my browser (mozilla firefox) it would load in offline mode, and an attempt to switch to online would freeze my browser. Upon running a quickscan with malwarebytes, i found there were 22 hits all under… you guessed it, revelantknowledge. I proceeded to attempt to quarantine and delete the spyware and adware, only to find that it would freeze up there as well. A search into the add and remove section of the control panel proved to hold the same results. It seemed that everything that had to do with relevantknowledge would lock up and stop responding when i attempted to get rid of it. At that point, i did a forced shutdown (holding down to power button until the computer shut down without saving) and rebooted my computer. As i did this, i made sure to disconnect my modem just in case. I accessed the add and remove section again, and was successfully able to remove the vexing program; where before the reboot, it had simply stopped responding when i attempted to remove it. Another quickscan on malwarebytes picked up the straggling spyware files, and as i’m typing this now, the add-on and it’s folders have all been completely wiped from my add-ons bar and computer. Anyone know what this crappy program does? I’m concerned about some security stuff I did before I realised it was there. It’s gone now (I think) but I’m worried my security was compromised. Darn this crap. Why do people bother? We notice it and remove it and then blast the software that does it. All it does is waste time. I used the free pyware remover Emsisoft Anti-Malware and also Malwarebytes Anti-Malware to get Relevant Knowledge off of my computer.. Relevant Knowledge was installed by FREE software I installed from TuCows. The software was a MP4 to MP3 converter. I finally figured this out after trying to re-install the converter, in the disclosure agreement, at nearly the end of the installation. So be careful about free software. Read the agreements. I think spyware is not the right term becasuse software is installed with user’s knowledge and permission and can be removed easily using uninstall program from the control panel. It’s not malicious. It is just a program that gathers some information about user’s browsing habits. It is a genuine piece of software. Initially I tried to remove relevent knowledge by uninstalling it via my control panel. It kept coming back though! Turns out that as long as I had the MP4 converter on my computer Relevent Knowledge would stay. So I had to uninstall the MP4 to MP3 computer in addition to uninstalling Relevent Knowledge and running Emisoft Anti Malware and Malwarebytes Anti Malware to get all traces of Relevent Knowledge off of my computer. Finally, Relevent Knowledge spies on you. Just in case you didn’t know that. Please be assured that comScore, the parent company of RelevantKnowledge, has invested substantial resources in making our data collection and privacy practices the best they can possibly be. Our company adheres to industry-accepted best practices regarding the collection and secure storage of the data collected by software such as RelevantKnowledge. comScore is recognized as a leader in the privacy space by organizations such as the OnlineTrust Alliance, where our co-founder Gian Fulgoni was a panelist earlier this year, along with representatives from the FTC and TRUSTe. (link to http://blog.comscore.com/2012/01/comscore_ftc_and_truste_headline_privacy_town_hall.html). Yes, we are sure you have made your data collection and privacy practices the best you possibly can, that is what most people do not like about your software, company, and those who promote your snooping software. That statement is total BS! It is SPYWARE. genuine piece of crap! Running a new Windows 7 system on a legacy PC with a slow single-thread processor. Installing some freeware to do some odds and ends. Booted up this morning, wondered why the system was going so slow all of a sudden. Looked at task manager – continual 100% cpu. Looked at the processes in descending cpu ranking, couldn’t see a major culprit. Cpu usage for the seoarate processes wasn’t adding up to anywhere like 100%. Mystified. A short while later a Relevant Knowledge survey pops up….what?!!! I’ve never subscribed to ANYTHING like this as far as I’m aware. Investigated briefly, removed Relevant Knowledge, suddenly my cpu drops from constant 100% back to normal usage. Three points: (1) If Relevant Knowledge DID ask for my permission to install itself I never noticed, and I’m generally scrupulous about un-ticking additional stuff I don’t want during installs. (2) OK this is a crappy old system I’m running here…but Relevant Knowledge turned it from usable to unusable. (3) What did I miss on the task manager cpu ranking display? How did Relevant Knowledge hide itself? Nasty nasty nasty whether you call it spyware or not. How do you sleep at night? You are evil, and no amount of false justification makes your software any less evil. If you can’t accept that what you produce is spyware, then you should at least acknowledge it as jerkware. Thank you for several things. Not the least of which is saving me from having to spend hours trying to figure out what “relevant knowledge” is really means. The first thing that would throw me concerning “relevant knowledge” is the “relevant” portion of the phrase. Up pops the question: “relevant” to whom? The answer can only be that the collected information is relevant (highly) to those that want to collect as much information about a computer and computer user as possible before they are found out somewhere down the road. Of course the majority of the time they will likely be never found out. People, and I include myself on too frequently on an occasion, click right through “privacy statements” and other “relevant” information that computer software developers are being given permission to collect and sell. Just how you go about marketing such information I do not know. I have never tried too do it. I suppose that there are locations where one is able to post the sale of the results of massive collection of information from spyware. If those sites on the web are rare now they are not likely to remain rare for very long. I do not want to continue to beat a dead horse. There is something about the confusion that the language describing the collection of “relevant information” is surely to cause that will keep this adware trend from becoming a dead horse for ages. As soon as the language used to disguise the collection of adware is discovered it. The syntax will undergo slight changes and it is off to the races again. Many of the above comments use the word “garbage” to describe the collection of “relevant information”. That is a much more polite way of saying the phrases that my brain is put together to describe what is sure to be a successful form of adware for years. Scammers never seem to sleep. I did proofread my document. “Dragon NaturallySpeaking” has a way of changing the wording of a document between the time of proofreading and the document’s actual transmission. Making EULAs Easy Discover if the software you’re about to install displays pop-up ads, transmits personally identifiable information, uses unique identifiers to track you, or much much more. EULAlyzer can analyze license agreements in seconds, and provide a detailed listing of potentially interesting words and phrases. SUMo no longer proposes Relevant Knowledge. Is it possible to update this article accordingly ?